The Mainstreet Classics 35-Inch Table Top Air Hockey Game can supply all the fun of air hockey, without taking up the majority of a game room with an expensive table. The compactness of the table enables easy storage and portability for condensed fun anywhere with a table or flat surface. A 110V motor with adapter provides steady air flow for more realistic air hockey action. 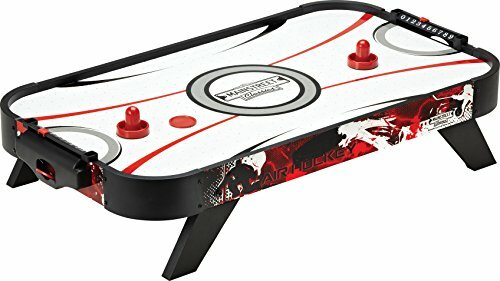 The Mainstreet Classics 35-Inch Table Top Air Hockey Game includes two pucks, two pushers (mallets), and two sliding scorers for scorekeeping. Dimensions: 35" L x 20" W x 8-1/4" H.